Cartoonist Ellen Forney explores the relationship between “crazy” and “creative” in this graphic memoir of her bipolar disorder, woven with stories of famous bipolar artists and writers. Shortly before her thirtieth birthday, Forney was diagnosed with bipolar disorder. Flagrantly manic and terrified that medications would cause her to lose creativity, she began a years-long struggle to find mental stability while retaining her passions and creativity. Searching to make sense of the popular concept of the crazy artist, she finds inspiration from the lives and work of other artists and writers who suffered from mood disorders, including Vincent van Gogh, Georgia O’Keeffe, William Styron, and Sylvia Plath. She also researches the clinical aspects of bipolar disorder, including the strengths and limitations of various treatments and medications, and what studies tell us about the conundrum of attempting to “cure” an otherwise brilliant mind. Darkly funny and intensely personal, Forney’s memoir provides a visceral glimpse into the effects of a mood disorder on an artist’s work, as she shares her own story through bold black-and-white images and evocative prose. Ellen Forney was diagnosed with bipolar disorder shortly before her thirtieth birthday. A lifelong cartoonist, she collaborated with Sherman Alexie on National Book Award-winning The Absolutely True Diary of a Part-Time Indian, and created Eisner Award-nominated comic books I Love Led Zeppelin and Monkey Food: The Complete "I Was Seven in '75" Collection. She teaches comics courses at Cornish College of the Arts in Seattle, Washington. "Ellen Forney's memoir of her bipolar diagnosis and long pharmacopic trek toward balance is painfully honest and joyously exuberant. Her drawings evoke the neuron-crackling high of mania and the schematic bleakness of depression with deft immediacy. Forney is at the height of her powers as she explores the tenuous line between mood disorders and creativity itself." "Ellen's work has always been hilarious and sharp, but Marbles has an emotional resonance that shows new depth as an artist and a writer. This is an extremely personal, brave, and rewarding book." 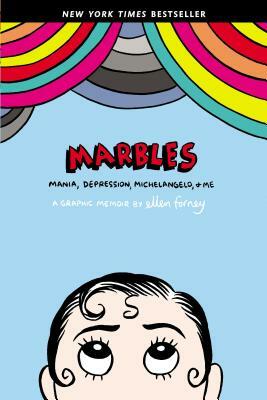 "I have always admired Ellen Forney's humor and honesty, but Marbles is a major leap forward. It's a hilarious memoir about mental illness, yes, but it's also an incisive study of what it means to be human and how we ache to become better humans. Amazing stuff." "Marbles isn't just a great story; it's proof that artists don't have to be tortured to be brilliant."